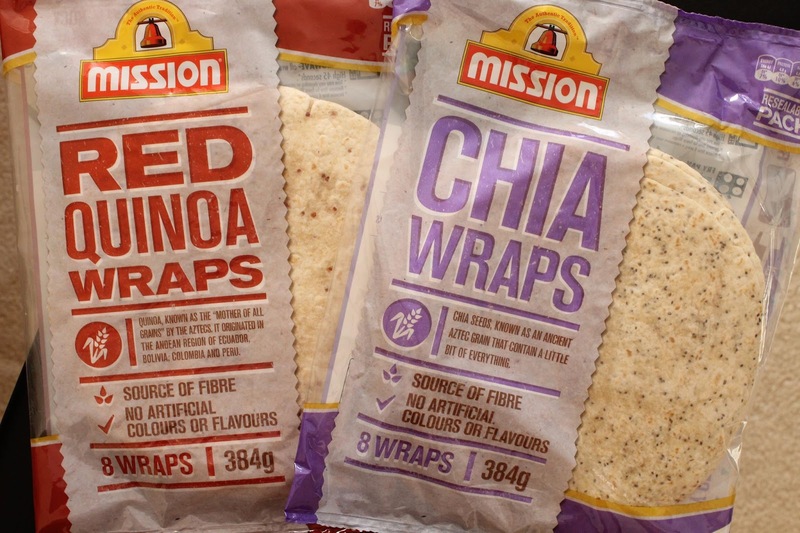 Mission Foods have recently launched some Chia and Red Quinoa Wraps which are another option for those who are more health conscious. I don’t usually do much of these product review things, but I had been looking up the nutritional properties of chia and quinoa for some patients during placement, so I thought it’d be perfect to try these myself! I’ve had chia previously, sprinkled on top of this and that- they’ve got a pretty impressive nutrient profile with high omega-3 fatty acids, dietary fibre, protein and calcium (which is actually higher per 100g than milk!). And quinoa- I’m sure you’ve all heard the nutrition spiel before everywhere, and to be honest I wasn’t quite sold myself, until I started dealing with vegetarian patients with various allergies and realised it is quite a good protein option, as it does contain all nine essential amino acids. So back to these wraps, tastewise, it’s great, especially when toasted! I liked that it’s quite similar to normal wrap as it’s doesn’t have quite as many ‘bits’ as wholegrain wrap. Reading the ingredients list, there’s not actually that much chia (2%) or red quinoa (1%) which is probably why it’s not too noticeable texture-wise (and there’s not artificial colours of flavours either). This does however, also mean that it’s not going to make a huge different to your dietary intake, but great to add just that little bit more nutrient to your meal- every little bit counts! In addition to the wrap bread, I was also sent a large selection of their other products which included everything from pizza bases, naan bread, tortillas and more varieties of wrap bread than I thought was possible!! Can’t wait to try out the other products, but I especially love the Soft and Fluffy Snack Wraps, which I made into quiches based on their recipe cards (recipe to come in next post) which was an excellent low fat alternative as a shell to shortcrust pastry. As with these wrap breads, I was going to make wraps for lunch all week, but because of my lack of planning, Sunday night came and there wasn’t much in my fridge to put in them, which doesn’t make for a particularly exciting lunch! Instead, I decided to make some hummus, sprinkle whatever veggies I had left in my fridge and roll them up to make some pinwheels to bring instead! Mission Chia and Red Quinoa Wraps are available in WOW and selected independent supermarkets (RRP $4.79). 4. Roll up tightly (as tight as you can! ), cut the loose ends off, then slice the each wrap into 5 portions. New to me because its rice and noodles for us. Still I am drooling with the dish you make. Chia seeds I've heard good for health. I love the sound of these wraps, and pinwheels are just perfect for a lunchbox.